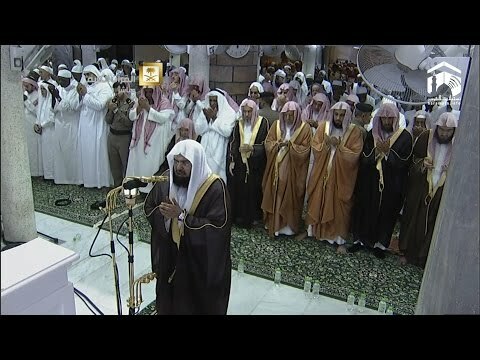 Sheikh Abdur Rehman As Sudais is Imam and Khateeb of Grand Holy Mosque Makkah. His complete name is Sheikh Abdul Rahman Ibn Abdul Aziz as-Sudais is very famous all over the Muslim World for his beautiful voice and stirring recitations of the Holy Quran, as he has held the position of Imam of the Holy Mosque in Makkah over past three decades. Sheikh Sudais was born in Riyadh capital of Saudi Arabia. He belongs to Anza clan. He memorized Quran at the age of 12 , in a Masjid headed by Sheikh Abdul Rahman al Faryan. He was also taught by Sheikh Muhammad Ali Hussan and Sheikh Muhammad Abdul Majid Zakir, as well as various other Scholars. Sheikh Sudais has graduated from 'Al Muthana Bin Harith' Elementary School in 1979. He has completed his Masters degree in Sharia in 1983 from Riyadh university and received a Ph.D in Islamic Sharia from Umm al Qura University. Later on he has served in Riyadh university as Assistant Professor. Sheikh Sudais was selected as Imam in the Grand Mosque at the age of 24. He has delivered his first sermon in July 1984. In 2012 he was appointed as head of Presidency for both the Holy Mosques and was given a rank of Minister. Sheikh Sudais has received a certificate from scientific institute "Riyadh" with outstanding Grade. Sheikh As Sudais was awarded as "Islamic Personality of the Year" in Dubai International Holy Quran Award in 1995. Sheikh Sudais is married and he has two sons and two daughters. Sheikh Sudais has played very important and major role against terrorism and clarified that "explosions suicide attacks and terrorism" are totally disgusting to the injunctions of Islam. Sheikh Sudais strongly condemned the "Lal Masjid" administrators on their role in 2007, in Islamabad Pakistan. Sheikh Sudais is very famous all around the Muslim World for his heart touching and emotional Style of Quran Recitation with Tajweed.